The big news on the banking front this week will be the public release of the stress test results, currently scheduled for Thursday (originally it was supposed to be today). Over at The Hearing, I wrote an overview post recapping the context for the stress tests and the current dilemma the administration faces: whether to keep quiet about the details, and risk undermining the credibility of the exercise, or whether to release signficant bank-specific information, and risk undermining the reputation of certain weak banks. There is nothing wrong with the concept of the stress tests, and arguably regulators should have been doing them constantly as the crisis worsened, so that this particular iteration would not create such a political challenge. The idea is that not only do you want to know how much capital a bank has right now, but you want to know how much capital it will have left if the economy continues to get worse. If you did this analysis in a way that was credible with the market, it would go a long way toward restoring confidence in the financial system, since the current lack of confidence is based on people’s not trusting the information they are getting. They have partially undermined themselves by using a “more adverse” scenario that is roughly in line with what most forecasters think is actually going to happen, so they are not very stressful. The administration has already as much as said that the banking system is well capitalized and no banks are going to fail, which makes it seem like the results are preordained. There is a widespread expectation, fostered by the administration, that any capital deficiencies will be plugged by converting preferred to common stock in an attempt to boost tangible common equity, rather than providing real cash money to banks. Most importantly, the announcement of the results was delayed so that the administration could negotiate with Citigroup and Bank of America over their report cards, which does not exactly foster confidence in the results that will eventually be announced. The term “stress test” was borrowed from medicine; do patients negotiate with their doctors over their diagnoses? While this may have started out as a technical, regulatory exercise, it has become an exercise in political communication. The goal is to be harsh enough on a few specific banks to maintain confidence in the stress tests, but be nice enough so as not to undermine confidence in the entire financial system. That’s ultimately what this is about. This entry was posted in Beginners and tagged Banking, regulation. Bookmark the permalink. I do not think this was ever a “technical, regulatory exercise”; the authorities did not provide enough resources (people or time) to do a credible job. This has always been a public relations exercise intended to shore up confidence. The IMF loss estimates are up to, what, $2 trillion or something? How exactly do we square that with a handful of banks needing less than $30 billion in new capital total? Clearly you didn’t read IMF’s report. You may want to try read first, think and than post? Why would anyone takes IMF estimates seriously? They put out one estimate at the end of last year. Only a few months later, they had to double it! James …. I’ll thank you again for all the beginner-level posts on this blog site. This one was particularly helpful, timely and relevant…. as they all have been. I’m not too proud at all to admit that I spend 10X the amount of time in the beginners pages as I do on the current event posts and comments. They may say “for beginners” but the information is definately grad school level finance, which is to say, substantive and challenging – but clear. You are a gifted writer and generous with your time especially since you are in law school?!? Seriously, sincerely appreciated! I don’t know who said it originally but I will repeat it — an informed and educated public is an empowered public. Keep up the great work. …then you are right; the actual IMF estimate is closer to $4 trillion in total losses. The IMF also estimates $275 billion in required capital injections for U.S. banks, or $500 billion if we want a “return of leverage to levels of the mid-1990s”. Cannot wait to compare these to the stress test results later this week. Along the same lines as above, the IMF report is long, 252 pages, but includes some assumptions which may be different than Treasury’s. Since Tier I capital is a small percentage (6% ?) of total assets, it does not take much percentage difference in asset impairment to make a big difference in capital requirements. The devil is on the details, of course. Nemo is on point. This was never anything remotely resembling a “technical, regulatory exercise”. It was a public relations opportunity intended for Geithner to essentially re-introduce himself and for the govt to try to instill confidence in their Treasury Secretary after his PPIP idea was widely panned. And to answer Nemo’s last question about how the govt plans to square against the IMF’s projections, they don’t. Write a set of specific rules, code them into law, make the law (and the agency) nuke-proof, and do them every 6 months. Apply them only to big banks (those that can create “systemic risk”). The net-net of that would be to increase capital-asset ratios for big banks over the long term (especially in comparison to small banks). As many people have noted, there are some benefits to being big, and there are some costs. If we can set an appropriately high “capital carrying tax” on big banks, then perhaps we can let the market work the way it should. This would provide some level of anti-cyclical protection, since the impact of a worst case scenario relative to projections in good times should be more dramatic than the impact of a worst case scenario relative to projections in bad times. There… Now I’ve gotten rid of my “excessive optimism” for the day. You should also think about how much weight to place on the accuracy of the report when the IMF estimate has to be doubled within just a few months as Sam points out. The regulators doing the stress test is working directly with banks. Giving the benefit of the doubt that the hundreds of regulators running the stress test aren’t all on the take, they and the Treasury should have superior information. Banks already run regular stress tests. Of course, the tests should be iteratively improved. The stress test the treasury is running is just more extensive than usual. Unfortunately, if you look at this crisis, the worst case scenario during the crisis advocated by the pundits are much worse than the worst case scenario during good times. You’ll find the same pattern with other financial crisis in other countries as well. Both greed and fear form positive feed back loops. Baseline Scenario, Krugman, etc are all adding to the current problem. All the while they self righteously wag their fingers at the banks. Of all the ridiculous endeavors the Government has undertaken, the stress tests may be the strangest. It really is like a bad grad school group project – completely esoteric, nothing happens based on the results, and a bell curve will be the graded results. Good thing we have some of the greatest financial minds coming up with tests like this and minding the store. For additional insight see http://www.bobgreenfest.wordpress.com. You guys are looking for formulas, answers and Truth when what is developing is a narrative, or, if you prefer, a dialectic is unfolding. Tension and conflict are necessary to produce whatever outcome results, but the technocratic distillate has already failed. We really need to put the politics back into political economics and what I like about this website is that it is a small step in that direction. Wait, which is it? Did I “clearly” not read the IMF report, or I should just not trust its numbers? Hundreds of regulators? I guess “more than 150” qualifies as “hundreds”, but that still works out to fewer than 10 per bank. So let’s see. We have stress test assumptions that are too weak, banks providing the models and analysis themselves, banks “negotiating” with their regulators… But sure, clearly that will produce “superior information”. I have great skepticism on this topic. Too many east coast ivy league elites looking at other east coast ivy league elites, almost no west coasters involved except a few small banks that made the big mistake with their own money (instead of investor’s money). I will not believe word one the regulators say, until we purge from our culture and society anybody who was ever involved in a bank in the last 30 years. Since we won’t do that, I personally am stockpiling food and weapons, because I simply don’t have any faith left in “greatest financial minds” or in fact, anything else related to markets that aren’t based on anything other than paper. The stress test is partly public relations! It is definitely a brilliant move by Geithner. To be complete, you need to point out the following. If the market is confident in the banks, then there will be no runs on the banks. If there are no bank runs, none of the additional money is necessary. Also, bank run is a liquid problem that affects both healthy banks and trouble banks. Rebuilding confidence will allow banks to earn their way out of their problem. It is the least costly to the tax payers. So far, the government has done a great job in this regard. Just look at LIBOR when Lehman failed to where it is now. Bank solvency is no longer a worry in the market. I won’t enumerate all the programs FDIC, the Treasury and the Fed have that has affect this significant change in market confidence. Suffice to say, this is credit to the whole Obama team. I was disappointed by Geithner’s earlier snafus when he became the Treasury secretary. However, I’ve been more and more impressed. All the pundits focus on wagging their righteous fingers at the banks. Geithner focused on turning the economy around. He is 3 steps a head of everyone. I can easily enumerate 3 that he out think baseline scenario! IMF will be proven wrong in just a few months when it put out another estimate update. Most likely, Geithner won’t even need to spend a big portion of the 135 billion he still has from the exiting TARP fund! Are you aware that your name is an anagram of “stingy shill”? Please consult the shill-to-Engish dictionary. Silly things, your post is insightful. You different points of view add a lot to the discussion of a complex issue. I am not interested in a community that is trap by groupthink. You should ignore Nemo. Many of his postings don’t add value to the discussion. He is a narrow-minded simpleton that rants a lot. I went from disliking Geithner, to feeling sorry for the guy, and now to being impressed by him. I completely agree. It would be nice to hear Prof. Johnson and Mr. Kwak address some of us who are more worried about the consequences populist revolt than hostage by bankers. Its painfully obvious how much political spin has corrupted these stress tests. What is arguably a very good idea, (and one that should have been implemented more often by banking regulators), has turned into the biggest PR stunt aimed at fixing that one intangible variable in all economic models: sentiment. The stress tests are just as laughable and useful as trying to value a company based on DCF. Equity analysts come up with “target prices” for the stocks they cover by magically predicting earnings results for the indefinite future, and discounting those results back by an arbitrary “cost of equity capital,” which is again, plucked out of thin air. Because of the incredible sensitivity to both of these assumptions, the final “target price,” has no more relevance than a monkey picking a number out of a hat. More often, the analyst picks a target price that seems reasonable, and then adjusts their cash flow and discount rate assumptions to arrive at their specific target. For the less financially savvy, my point is that the stress tests, by definition, involve making so many assumptions that it seems nearly impossible to give any credit to their outcome. The ratings agencies and banks have arguably been doing stress tests on loan bigs, mezzanine tranches of CDOs, and everything in between for years, and we’ve learned that those tests can be horribly inaccurate if the assumptions are incorrect. What seems more likely, is that the government worked backwards, much in the same way equity analysts do. They picked a target amount of “required capital” that each bank would need…enough so that the public believes the tests were rigorous, but not enough to scare us all into withdrawing our deposits. Then they came up with an economic scenario which would arrive at those levels of “required capital” for each bank’s loan book. Their bet is that investors and counterparties trust the tests enough to believe that there is nothing else hidden in bank balance sheets, and the “crisis of confidence” regarding the banking sector will go away. If this magically PR stunt fixes the confidence problem, then interbank lending will resume, which will then lead to a narrowing in corporate credit spreads, and will eventually turn on the credit spout to small businesses and consumers…a self-fulfilling cycle that “proves” the results of the tests correctly. However, if this stunt doesn’t work, and the consumer loan and mortgage books deteriorate faster than the easing of credit can help the economy, then we could be in for a much worse repeat of Fall 2008. I totally agree with almost everything…but I don’t think it’s luck that has created this huge stock market rally. It was taxpayer money being funneled to the big banks via AIG that allowed Citi, BofA and Goldman to come out with their “We were profitable in Jan and Feb…so we’re healthier than you think!” statements…and (if memory serves) that was pretty much the start of the bank rally…so I’ll give Geithner kudos for getting the market to where he wanted it before announcing results. I too thought about the reverse engineering of results to fit into how much capital Treasury has left…but with bank stock prices up, why not have some of the deemed weaker banks float some bonds to give the tests an air of impartiality. And who would buy these bonds you ask? Well, pension and bond funds…assuming of course these bonds are backed by the full faith and credit of the American taxpayer. Some people believe some of the big banks are insolvent, that their assets are worth less than their liabilities. You and others believe that they are illiquid, that their inherently-valuable assets are underpriced by the market and they are unable to sell them at a fair price. This is an honest disagreement about the facts of future cash flows of very complicated assets which even insiders whose full time jobs were to value them (and who got paid orders of magnitude above the median US salary for doing it) couldn’t do right. Under the illiquidity assumption, the banks will be able to ride out the rough market and then the “true” value of their assets will become apparent and they’ll be able to sell. Additionally, they are profit machines (as evidenced by their returns pre-crisis) so they can also use that ability to make up any real gaps in their balance sheets if the government will just give them a chance. Evidence of their solvency comes from the fact that the Treasury indicates they are solvent, which will be especially true if the stress test come back clean. Under the insolvency assumption, the banks’ assets won’t come back even in a liquid market (perhaps not even in a government subsidized liquid market). Under this assumption, the profits of the last many years have been illusive (if not fraudulent) and letting the banks try to “earn their way” out of their hole encourages them to make outsized bets (even bigger than the ones that got them into this mess). This could lead to even bigger damage to the financial system, especially if “too big to fail” banks get even bigger while getting even weaker (with, for instance, government subsidized roll ups on their weakest brethren). In this case, regulatory capture more than robust analysis is the cause of positive stress tests. Under this assumption, the facts that the government indicated solvency before releasing the stress test results and that they are “negotiating” the results with the banks indicate they are more political than factual (a point you seem to be ok with since this will nonetheless improve market confidence). However, market confidence in banks comes from some combination of confidence in their financials and confidence in the fact that the government will not let them fail… will neither let the common stock holders lose too much money nor let the bondholders lose anything. Why should an investor care whether they will get paid through earnings or government pay-outs (itself part of the problem, but a definite factor in today’s market)? Opinions on the proportion of actual financial strength vs. government backing in stock performance stem from which of the two scenarios above you believe. Market confidence itself is not an indicator which of the assumptions (illiquidity or insolvency) is true. Prof. Johnson and Mr. Kwak have made it abundantly clear what they believe and why on both the topics of the likely situation of the banks and the likely reason that the government is unwilling to publicly (or otherwise) recognize it. You can, obviously, disagree with their chosen forecasts and/or with their interpretation of the government’s actions. Forecasting the performance of bank assets is hard. Honest and smart people disagree. Stop coming on here and making bold assertions and accusations of bias with no backup. If you can “easily enumerate 3 that he (Geithner) out think baseline scenario!”, do it. Make the argument. I’d love to hear it. I’m an electrical engineer who, admittedly, is out of my element here. But I have experience in dealing with complex problems which involve many inter-related variables in systems that are dynamic and unpredictable. I think this financial crisis is something like that. In the engineering world, we approach these problems pragmatically, probing as we go, gathering info and adjusting the course based on the facts and the crisis du-jour. Developing and sticking to a detailed A-Z plan developed up front with some sort of “stay the course” headset is folly. I think Geitner is approaching this problem like an engineer. These “stress tests” are just info gathering tools. It’s no surprise to me that he has not pre-declared what he would do with the results. This is a call you make only after digesting the results and weighing that against the current state of the system. In the larger picture, the lack of specificity the press and the pundits criticized him for is actually encouraging to me. It tells me he’s playing this by ear, which (IMO) is exactly the right thing to do in this situation. If none of that makes sense, consider how the NASA engineers got the Apollo-13 astronauts home. In brief, they made the solution up as they went along. I salute the engineers in that situation, but I also salute their management who had the good sense to stay out of their way. So I’m going to be patient and watch this economic engineer and his people play this one by ear. I’m slow, of course. But when all is said and done, what’s the real value of the assets these banks hold against the equity to support them. Giving/forcing more equity doesn’t change the value of the assets the additional equity offsets (although it may give some recognition to actual situation). Holding to a “stress standard” (minimal sweat, it seems) that indicates which banks may become insolvent under more severe economic conditions, doesn’t address the underlying reason for their current weakness – or actual insolvency. And then, if the market won’t, the taxpayer will once more make up the difference, and the asset side remains the same. What am I missing? I think you are missing the point Silly Things is trying to make: in the banking sector, unlike any other industry, a liquidity problem begets an insolvency problem. So what can start out as one, can quickly morph to the other, but its cheaper and more efficient to fix it as the former rather than the latter. Its like a flu turning into pneumonia. If you can fight the flu, then you save a lot of time and effort, rather than waiting for it to turn into pneumonia, and then trying to fight it. Here’s a very crudely thought up example. Let’s take Southwest Airlines. I don’t know any of this for a fact, but I’m hoping that because they’ve been a very profitably run airline for the last 30 years, I’m going to posit that they are solvent. Their assets are greater than their liabilities. Now, suppose Swine Flu forced all major countries to impose a moratorium on air travel, for at least a week. I would argue that their assets are still greater than their liabilities…so they are still solvent. However, if they have some commercial paper or a trade creditor’s payment due within that week, then they are screwed unless then can get some short term financing, from a bank, or the government or otherwise. Classic example of a liquidity problem, but not a solvency problem. A) “Rebuilding confidence will allow banks to earn their way out of their problem.” Confidence is important to the survival of a bank, but its lack of is not the problem here. B) “Rebuilding confidence will allow banks to earn their way out of their problem”. This would be fine, however if an institution is insolvent history shows that they either make super risky bets to “earn their way out of their problem”, or they become so conservative that they don’t lend to the economy (see S&L crisis and Japan’s lost decade). This is why we typically CLOSE insolvent institutions and don’t let them earn their way out of their problem. That aside, the primary way the FED and the treasury have worked to “rebuilding confidence” is to risk sovereign insolvency and by providing subsidies to banks that haven’t proven to wisely lend the money their depositors and investors have already given them. C) “IMF will be proven wrong in just a few months when it put out another estimate update.” When looking at the global crisis how wrong can they be?! As Churchill said, “This is not the end, this is not even the beginning of the end. But it is the end of the beginning.” There is far more to unfold in this global unwinding that will play out over several more years. In historical comparisons terns where somewhere between the spring and fall of 1931 and lot happened between then and the actual bottom. It’s too soon to say we’re at the bottom and while the rate of decline has slowed that by no means indicates that growth is right around the corner. I’m familiar with the process of bank runs. I watched It’s a Wonderful Life too. Here is my question: is there a number of months out from the initial shock or a number of trillions of taxpayer dollars poured into the banks where you would begin to believe the banks’ problems stem from buying really stupid assets and booking fake profits rather than from a short-term cashflow problem? What if rather than swine flu, Southwest’s problem was that it was revealed all their planes were rusting out and they’d booked extra profits by not buying any insurance on them? They’re unsafe to fly so useless to generate cashflow, no one wants to buy them (even if the swine flu scare was over and the market for planes was humming along), but they still have a huge book value. Southwest would look solvent on the books, you could look back and say “man, those guys sure raked it in before the swine flu”, but they’d still be a worthless company. That’s what some people think is going on with the banks. Only, because as you point out, banks’ assets are somewhat about perceptions and many times harder to value than planes, the banks and the government can play a lot of games to keep everyone guessing about their value. They keep you guessing liquidity problem. Others still think solvency problem. I haven’t seen conclusive evidence either way and you and Silly aren’t offering any on the liquidity side. And all the banks (like Lehman in your example) had nearly riskless parts of their operations that were cash cows and critical to the functioning of the market. They levered them up and used the proceeds to gamble on prop trading and other crap on which they lost massive amounts of money. The fact they had these sources of cash doesn’t make them solvent any more than the fact I have a job would make me solvent if I went out and blew a bunch of credit card cash advances in Vegas one weekend. If my parents loaned me a big bunch of money and held off my creditors indefinitely, I could eventually “earn my way out” of the hole with my steady job… but the easiest way would be to go back to Vegas and put my loan from my parents on the pass line (ok, some of it, then put odds on that). A better stress test would have been to let the banks fail instead of printing up colossal amounts of TARP money to keep them in business. The idea that they’re all too big to fail only takes away accountability, and in a broader sense asset values have to be in line with the cashflow they produce – not artificially propped up by printing money. The Chrysler bankruptcy is a good example of why the bailouts are flawed, with bondholders perhaps insisting on a bankruptcy to cash in their AIG-government sponsored CDS. Anyone who believes middle America benefits from the survival of the banks on Wall Street, I have a mountain top in Peru I’d like to sell them. What do you think is the most important challenge for our society today? I think the most important challenge is to turn around the economy as quickly as possible. Figuring out rather our banks are illiquid or insolvent is by far not the most important issue. This is because cleaning up our banks is “not necessary (or actually sufficient) for a rapid economic recovery”[Simon Johnson]. The last 2 are debates between Simon and his colleagues at the Petersen Inst. 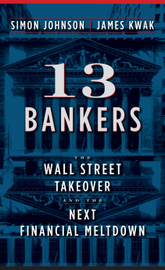 They are excellent and have a lot of information on how the US got out of past financial crisis. I agree with you “market confidence itself is not an indicator which of the assumptions (illiquidity or insolvency) is true.” But that isn’t my point. My point in the original post was “rebuilding confidence will allow banks to earn their way out of their problem. It is the least costly to the taxpayers.” This will help with the economic recovery. Clarifying liquidity vs. insolvency is unimportant (this evident from our past financial crisis). However, fanning fear, uncertainty and doubt (FUD) for our financial system will hurt the recovery. To get a deeper understanding you have to listen to the debates above. At the root of my disagreement with SJ and JK is a question of *priority*. In my view, we should turn around the economy first. Reworking our financial system and the financial regulations is second. If a house is on fire, put out the fire first and than worry about changes to the fire code and the code’s implementation! I won’t repeat each of SJ and JK’s ideas on banks here. You’ll have a better understanding of the problems if you reread the old posts from SJ and JK and my comments. I think SJ and JK are doing more to hinder the economic recovery than to help it (keep in mind SJ and JK also write for a number major media outlets). Trae, you wanted an enumeration of things Geithner did better than baseline scenario. This partial list should do. Also if you need more convincing what the priority should be just consider the unemployment rate and the human hardship this implies. People who argue that we must punish the banks at all cost right now are narrow-minded and insensitive to the suffering of their fellow men. There are now some encouraging signs of improvements in the economy. I am hoping may be in another quarter I can stop criticizing SJ and JK. I’ll instead rethink with them how to rework our financial system. In case you are curious, I’ve always thought bad regulation was one of the root causes of this crisis. Please let me know what is your priority. No idea if you’re still looking at this post or not, but here goes my response. I guess you got to an even more fundamental disagreement than the one I was getting at. To answer it: I think the most important challenge for our society today is that of placing our economy on a firm foundation for sustainable growth. Unfortunately, the analogy for the world economy is not one house in a neighborhood where we can put out the fire then go crash on someone’s couch while we rebuild and redesign the fire code. We have to put out the fire and rebuild the foundations at the same time because we’ve seen time and time again that once the fire is out we choose to throw a little party instead of doing the hard work of fixing the foundation. You assert it’ll be different and we’ll fix the core problem once the fire is out. If it was as simple as “bad regulation” maybe that would be possible, but Simon and James have presented tons of evidence and arguments that the power of the banks itself helped to undermine the foundations. I don’t see how pouring money into them and playing nice while they rebuild that power will allow us to do so. This is another fundamental disagreement between us. Your stance that anyone who argues for punishing the banks now “are narrow-minded and insensitive to the suffering of their fellow man” is a cheap shot. The disagreement is about pain now vs. pain later. We got out of the last recession relatively pain-free (at least from a GDP-growth perspective, as for the pain felt by the middle-class family, I question that) by setting up the debt bubble that got us into this one. There is a lot of desire to talk our way out of this mess as well, so you’re probably right, if everyone shuts the hell up and lets Geithner and the banks tap-dance their way out of this, we “get out” of this recession more quickly. It’s all about your time-frame for “economic recovery”… if you’re just looking to the next peak you want one thing, if you care about the next many cycles and think this is a unique opportunity to counter the power of the financial oligarchs, another. Neither is looking to expand human hardship to prove a point. We just (fundamentally) disagree on the time-line we should focus on. FUD (what is this, Slashdot?) implies false fear, uncertainly and doubt; sewing discord to achieve some ulterior motive. The fear and doubt on the part of myself (and I imagine Simon and James) is quite real, sincere, and focused on the problem at hand. That we are fearful about something different than you (long-term sustainability vs. short-term crisis) means we disagree; not that we are disingenuous, irresponsible, and insensitive to the pain of our fellow man while you are honest, responsible, and caring. I think the best way to sort out our difference is to get concrete with the date on when to cleanup the banking regulations and bank structures. Here is my take. I am not suggesting we wait until the economy has fully recovered before we address the regulatory shortcomings and structural issues with the banks. In fact, as I mentioned in previous post, I’ll likely start to support these efforts if the improvements in the economy continues for another quarter or so (~Sept). Most people have suffered huge financial lost during this crisis. Employment recovery will also be long and gradual. Therefore, for many the pain is deep and the hardship will be long. Quite frankly, it is very unlikely that people will forget this experience in a few years. We have time to do things right. Anyway, around Sept is my date to supporting effort to revamp the financial system. What is yours? Let me also elaborate a bit more on what is wrong with the efforts of Simon Johnson and James Kwak. We had Lehman in mid Sept 08. As a result of systemic risk of Lehman, we’ve been in the deepest recession since the Great Depression. Since I started reading baselinescenario in mid Jan 09, SJ and JK has been pushing for nationalization of banks, wiping out the investors, forcing bondholders to take losts, breaking banks apart, and generally threatening banks’ survival. SJ and JK were pushing strongly to have these actions take place *immediately*. SJ and JK were *not* merely laying the groundwork. SJ and JK were very critical of Geithner for not following their suggestion. Do we really think the world can take another Lehman like shock gracefully any time in the last 6 months? Well here is one of many data points to consider. Larry Summer mentioned around March that the stock market after correcting for inflation has dropped to 1970s level! Or put it another way, people in the stock market is predicting with their money that the world economy is heading toward the deepest and darkest abyss of our collective living memory! Should we shock the economy one more time just to make sure we do deep dive into the abyss? Let’s also look at the impracticality of the efforts being pushed by SJ and JK. My previous post already list all the hurdles SJ and JK will face. The evidences are overwhelming that nothing will get resolve quickly or efficiently. What would happen to the economy if we now have to deal with all these additional fear, uncertainty and doubt? Now let’s take a look at whose lives are SJ and JK messing around with. Who do you think are the biggest shareholder in say Citibank, BA, etc? The biggest investors are the ordinary folks with their retirement accounts and pension plans. Had we nationalized these banks, then these ordinary folks would have ride down with the market crash but will not get to ride back up during the recovery. This is when the real serious wealth transfer happens! I have also written the technical problems with the suggestions SJ and JK are pushing. I’ll just quickly summarize here. First, SJ and JK’s suggestions are pro-cyclical and will exacerbate the crisis. Second, SJ and Jk’s suggestions have significant inconsistency with historical experiences. At any rate, I hope the schedule I had in mind sounds reasonable. However, if you disagree, please let me know where to optimize further. Strangely enough, I think we’re back to the liquidity vs. solvency question, except this time for the economy as a whole. If you believe this crisis was just a liquidity hiccup in the credit system, by all means we should get money flowing again ASAP and patch up the system later so that it will be more robust to these types of shocks in the future (e.g. ensure no one firm is so central to the system that its failure will threaten everyone’s cashflow). I worry, though, that this crisis is just the first indication that many of the economy’s assets (namely financial services firms) are being carried on the books at values higher than is justified by their ability to generate real production. Specifically, I think a great deal of the value that appears to have been “created” in the financial system over the last many years was actually extracted from productive industries and the taxpayers. We’ve happily counted this “production” as part of our economy and even begun to divert otherwise productive resources (mostly in the form of smart people) to this sector. By propping up the financial system we’re effectively doubling-down (or quintupling-down) on these assets. This is fine if they really are productive. In the kindest scenario, all the financial engineering is actually making capital more productive in real terms. This is clearly true in some cases. The farmer who can effectively hedge his exposure to price fluctuations can focus his efforts on growing food rather than worrying about prices and will be more productive. Great. Putting everyone’s retirement in stocks through 401Ks probably marginally improved the efficiency of the public equity markets making firms’ cost of capital lower so they could do more projects. Cool. At some point, however, the deals become zero-sum. Do you really think the capital market efficiency added by allowing hedge funds (or bank’s prop trading desks) to operate is anywhere close to the amount they make? No, they’re mostly extracting value from other parts of the economy (probably mostly suckers like me with my 401K). The exact point at which financial engineering moves from being productive to being extractive is an empirical question and I’m sure it will vary over time and place, but I would argue its much less than the ~20% of GDP and 40% of corporate profits we’ve been running at. Pre-crisis this might have seemed reasonable, now it seems highly unlikely. Another option is that financial services are such a large proportion of our (and the UK’s) economy because that’s where our competitive advantage lies and we’re doing it for the rest of the world, somewhat improving their productivity but mostly extracting value from their productive industries. Not sustainable, but Ok for a while I guess. So, if the majority of the financial engineering is productive, full speed ahead with the recovery. If it’s not but we’re using our competitive advantage to extract from the rest of the world… we can still continue with the recovery but should limit how much we depend on FS going forward (eventually the world will wise up). In these scenarios there is some danger on the edges with regulatory capture and the debt we’re taking on to do it, but in nothing we can’t deal with in the long run once the economy is back on its feet. If, however, the assets are actually worth far less than we think – if the profits of the major financial firms are based primarily on extracting value from domestic industry and the taxpayer rather than creating value – we need to be extremely careful rebuilding our economy on that foundation. In this scenario, the push to get the economy running again will be like telling a guy with two broken legs to walk it off… the adrenaline of the massive infusions of taxpayer money may even let us take a couple of steps, but we’re eventually going to come crashing down again and will have done even more damage in the interim. The administration is understandably terrified of this scenario… hell, I’m terrified of this scenario but in my mind it is the most likely explanation for what we’ve seen. And as someone who believes this, it’s obvious to me the first step has to be to break the stranglehold of the banking oligarchs so that they’ll stop extracting and distorting our economy away from productive uses. If we reveal this scenario to be the case, the stock market will crash, the credit markets will seize up, people will lose their jobs… there will be blood. But, to quote Warren Buffet: “the most important thing to do if you find yourself in a hole is to stop digging.” If we don’t then the next time we find ourselves with an opportunity to turn this thing around, we’ll be starting out much deeper. Pingback: CJO’s Avenger212 - StressTest? Would you feel healthy? Hey, did you get a chance to listen to these debates I wrote previously. They are really good and well worth your time. Doh, sorry Trae, I accidentally put your name in the name box.